With the ABACO 800, OCQUETEAU offers you an open sport boat for outboard engine, uncompromising, ultra-efficient, comfortable, elegant and spacious craft ! On the well crowded open sport boats market, where leaders compete commercially with their best selling walk around (WA) and central console (CC) like the Cap Camarat for Jeanneau, the Flyer for Bénéteau and Activ Open for Quicksilver, Ocqueteau had to propose an innovative boat that goes beyond the limits of this segment. Thanks to its reinforced IFH hull, more technical, stiffer and more efficient, thanks also to its more spacious and ergonomic deck, OCQUETAU has designed for you an uncompromising speedboat wich will grant you exceptional space, comfort and performance with great ease of use. The stern lift-up hood, wide gangways, double adjustable table, foldable bench seats, front lockers, everything is designed to maximize space on board and storage capacity. Under deck and centralconsole, the space can be arranged (pack Overnight) with a double berth and sanitary to be able to spend one or two nights on board. The central console has been designed with the double aim of effectively protecting its occupants at high speeds and offering all the necessary comfort on board. In particular, the windshield has been designed to allow you to sail with the hair in the the wind at moderate speed, or at high speed to be sit well away from spray and wind, with profiling intended to limit turbulence, wind and noise. The central bench seat can accommodate the driver and two passengers. It shelters, under its lift-up seat, a kitchen block with sink and water under pressure, a cooler or a refrigerator and numerous tidying up (pack Premier). With a foldable bench facing the cockpit, the two side seats and the back seat, up to 8 people can settle around the double table (pack Lounge). In the bow rider, an extra large sunbath (pack Soleil) allow you to do ... absolutly nothing! Enjoy it, that's all. His plan is elevated to provide excellent ventilation, tanning and rejuvenation without cooking! Finally, for speed enthusiasts, a Racing version that can accept up to 400 hp is available. Come day after day to master the sea and your machine to fully enjoy the last space of freedom that is the sea, far away from radar! With a little practice, you will exceed speeds unsuspected for the state of the sea, as its hull is easy to fly and comfortable even when conditions get rougher. 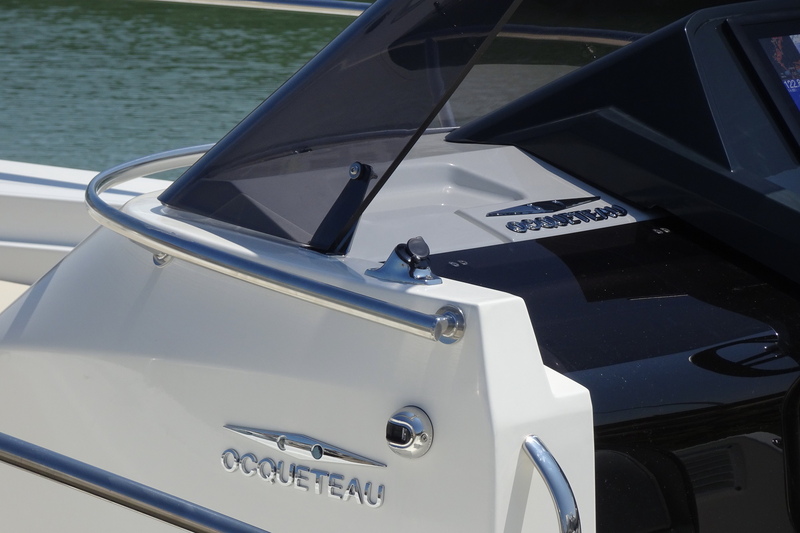 With 20 ° at the bottom of the transom, it is the most sporting hull of the range Ocqueteau. 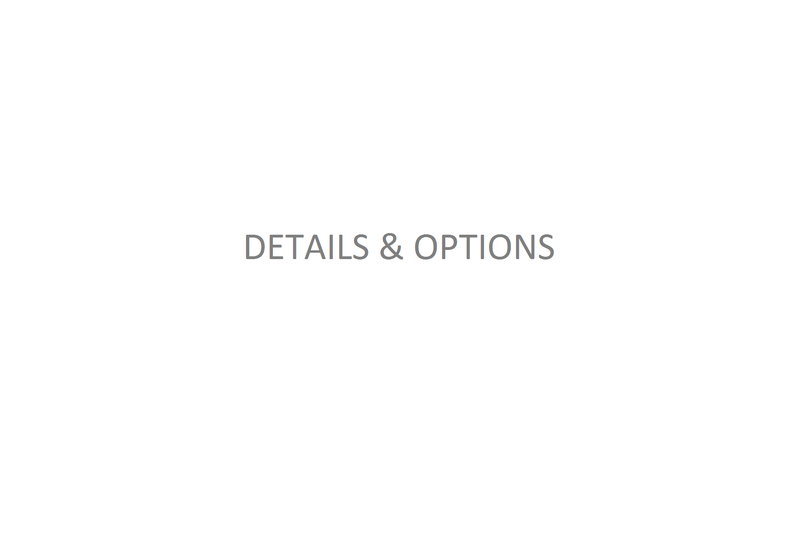 It offers a very good compromise between performance and comfort. And its IFH hull made of glassfiber/wood/honeycomb vacuum infused sandwich guarantees rigidity and exceptional lightness, to combine controlled consumption and rare performance: 50 knots with 400 hp and 37 knots with only 200 hp. One of the fastest sportboat available on the market. This pronounced hull angle combined with a lower center of gravity and the ability to rig high power single-engine makes the ABACO 800 an excellent platform for water skiing and wakeboard by offering a beautiful, easy-to-model wake by loading the boat. on the back. An optional ski-pull rollbar is available. On request side reinforcements can be inserted during the construction to install a custom wake tower. Version R, engine MERCURY Verado 400 Racing, propeller Mirage Plus inox 3x15x17 inches : more than 50 knots @ 7000 rpm ; consumption at 35 knots @ 5100 rpm : 64 L/H ; at 28,5 knots @ 4000 rpm 39 L/H.